1046 New Holland Ave., Lancaster, PA 17601 U.S.A. In a Variable Conductance Heat Pipe (VCHP), a Non-Condensable Gas (NCG) is added to the heat pipe to vary the condenser length, and hence the conductance. A Pressure Controlled Heat Pipes (PCHP) is a modified VCHP, where the heat pipe operation is controlled by varying either the gas quantity or the volume of the gas reservoir. This paper will discuss two applications for PCHPs: 1. Precise temperature control, and (2) Switching thermal power between multiple sinks. 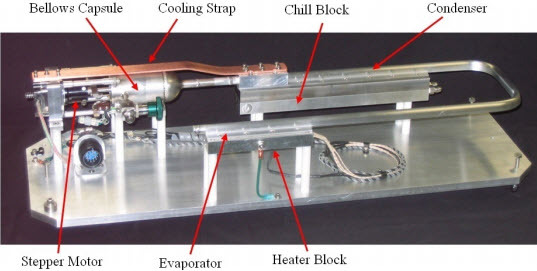 A prototype aluminum/ammonia PCHP was built and tested to demonstrate the capability of controlling the temperature of the evaporator section of an aluminum/ammonia pressure controlled heat pipe to milli-Kelvin levels over an extended period of time, while the heat sink temperature and evaporator power were varied. In a second program, a heat pipe solar receiver was designed to accept, isothermalize and transfer the solar thermal energy to reactors for oxygen production from lunar regolith. The receiver has two PCHPs and two Constant Conductance Heat Pipes (CCHPs) to supply heat to two reactors. During operation, one reactor is producing hydrogen at low solar power, while the other reactor is warming up a fresh batch of regolith. The PCHPs are used to switch power between the two reactors as required. In a Variable Conductance Heat Pipe, the NCG mass and volume are fixed. When the heat load increases or the radiator sink temperature increases, the temperature (and pressure) of the heat pipe also increases. The increase in vapor pressure forces more of the non-condensable gas into the reservoir, which moves the vapor/noncondensable gas interface further into the condenser, and increases the effective condenser conductance. This change in conductance allows a VCHP to maintain a relatively constant temperature as the power or heat sink conditions change. With a heater on the reservoir, the VCHP temperature can be maintained within a few degrees Celsius. Pressure Controlled Heat Pipes (PCHPs) are similar to VCHPs. The vapor/non-condensable gas (NCG) interface position in the condenser moves to vary the conductance of the heat pipe. The control mechanism in a PCHP, however, is active. This provides much closer control of conductance and can allow changing of the set point temperature after assembly of the heat pipe. Two different control mechanisms are possible: actively injecting or removing NCG, or by varying the volume of the reservoir by contracting or expanding a bellows. PCHPs were initially developed for precise temperature control of annular heat pipes operating in the region of 1300K. Using a gas injection mode of control, the PCHP operating temperature was stabilized against changes of input power or heat loss to within 0.001K for several hours (Bienert, 1991). Modulation of the reservoir volume is the other method of controlling the PCHP. In this concept, the NCG reservoir includes a bellows structure. 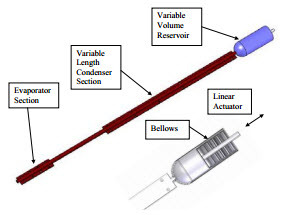 A linear actuator is used to drive the position of the movable end of the bellows, thus modulating the volume of the reservoir; see Figure 1. The bellows system was selected for the PCHPs below, since it is simpler to implement for space applications. Regardless of the method used, it is the variable reservoir volume or variable NCG charge that allows the PCHP to define a set point (over a wider temperature range), and to control temperature precisely about that set point. In contrast, even with an unusually large reservoir, conventional VCHPs in a thermal network have a fixed set point, and are not capable of precision temperature control to the milli-Kelvin level. Figure 1. Volume modulated PCHP. Precise temperature set point control to the milli-Kelvin level without power-wasting trim heaters and without a massive reservoir. Nearly instantaneous reaction to changes in the environmental conditions (low thermal mass lag). Ability to adjust the set point in-situ. Thermal analysis and ground testing can differ by asmuch as ± 10K from the results in space. The PCHP compensates for these discrepancies in real time after the satellite has been placed in orbit. The control scheme for the PCHP for precise temperature control is shown schematically in Figure 2. With a suitable feedback control system, the PCHP can achieve milli-Kelvin temperature control of evaporator temperature while compensating for changes in sink temperature or input power without the need for the large VCHP reservoir. 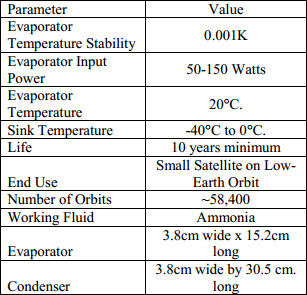 The design requirements, shown in Table 1, were selected for a hypothetical but typical spacecraft cooling application in low earth orbit. 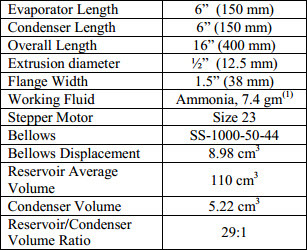 The design parameters for the PCHP are shown in Table 2. One of the flight-weight devices is shown in Figure 3. It is mounted on a test fixture with electrical heaters at the evaporator and a liquid nitrogen (LN) chill block at the condenser. Heat from the stepper motor is rejected to the condenser through the cooling strap. The bellows is contained in the bellows capsule, which assures alignment and prevents overstressing due to accidental overtravel. The PCHP body is bent to fit into a particular thermal-vacuum system. Figure 2. Schematic of Pressure Controlled Heat Pipe showing feedback control of reservoir volume and condenser thermal resistance. Cycle testing of candidate bellows assemblies to demonstrate that they can withstand the number of flexures required over a 10 year life. Cycle testing the selected stepper and drive to demonstrate operation in vacuum. Details of these qualification tests are given in Anderson (2011). For testing, the PCHP was mounted to a rigid aluminum fixture with screws at each corner to precisely adjust the PCHP inclination. The PCHP evaporator and condenser flanges were bolted to rectangular aluminum blocks that supply heat and serve as a heat sink. The whole system was then inserted in a thermal vacuum chamber. Details of the test setup are given in Anderson et al. (2011). The PCHP had excellent temperature control during the thermal vacuum tests. Figure 4 compares the open-loop and closed-loop response of the PCHP over variations of input power. This PCHP is able to maintain a steady evaporator temperature (measured by the RTD) over input powers ranging from 50 to 125 Watts. In the figures, Open Loop refers to the no control case, or behavior as a passive VCHP, and SP refers to the Set Point Temperature in closed loop mode. Figure 4. 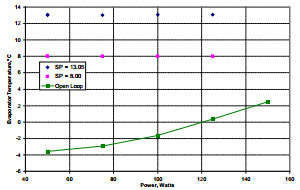 Comparison of Open Loop and Closed Loop response of the PCHP in vacuum over changes of input power. A second application for PCHPs is their ability to switch power between different reactors at high temperatures for In-Situ Resource Utilization (ISRU). The lunar soil consists of approximately 43% oxygen that is contained within the oxides of the lunar soil. Oxygen is produced by heating the regolith to 1050°C, then flowing hydrogen through the regolith. The hydrogen reacts with the oxygen in the lunar regolith to produce water. The water is then electrolyzed to produce oxygen, and the hydrogen recycled into the process. The mass of the overall system can be minimized if one solar concentrator supplies a constant rate of power to two reactors, with the power switched from one reactor to the other as fresh batches of regolith are added. Figure 5. Schematic of the PCHPs (shown as SHRP #1 and #2) and CCHPs used to transfer heat to the two reactors. Two SRHPs, one for each regolith processing reactor. Two CCHPs, one for each reactor. A primary condenser on each SRHP. A secondary condenser on each SRHP, with bellows to vary the reservoir volumes. The SRHPs are used to control the gas front location, and therefore control the power delivered to each reactor. The CCHP transfers the thermal load to the reactor from the variable conductance SRHP. CCHPs are used to provide uniform heating to the regolith. The change in the exposed length of the two condensers of each SRHP would vary as the power was transferred. The secondary condensers provide a method to reject excess heat, so that the concentrator can always deliver the full heat load to the SRHP. The SRHP is divided into two halves that are thermally connected, with Non-Condensable Gas (NCG) added to each side. Each half has a side arm which serves as a primary condenser, a secondary condenser and a bellows. During steady-state operation, one reactor is gradually heating the regolith, while the other reactor is extracting oxygen. The bellows are used to control the location of the gas fronts on each side, and hence the heat supplied to each side. Step 1. The SRHPs are at 1050°C, and cold regolith (600°C) is loaded into the reactors. During the loading, the bellows are fully extended, so gas blocks the CCHP evaporators. This is done to maintain the temperature of the SRHPs, which otherwise would quickly drop to 600°C, due to the high power capabilities of the heat pipe. Once the regolith is loaded, the gas in the Right Hand Side (RHS) is withdrawn slightly, so that 3 kW is supplied to warm up the RHS reactor. Step 2. 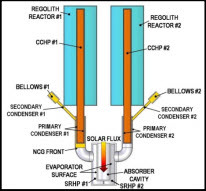 As the RHS reactor warms up, the driving force between the heat pipes and the regolith diminishes. The RHS bellows is gradually withdrawn to maintain the 3 kW heating. The picture in Step 2 shows the NCG gas completely withdrawn from the RHS CCHP evaporator. Step 3. As the RHS temperature approaches the final 1050°C temperature, the ΔT diminishes so that less than 3 kW of power can be conducted into the RHS reactor. The excess power is radiated from the secondary condenser. The picture in Step 3 shows the condition when the RHS reactor is at 1050°C: 1 kW is supplied to the reactor to make up thermal losses, and the other 2 kW is radiated. At this point, the RHS reactor is at temperature. Hydrogen then flows through the reactor to produce water, which is electrolized to produce oxygen. Step 4. The 3 kW of heat is then supplied to the LHS reactor to warm up the regolith, while the RHS reactor produces oxygen. When the oxygen has been removed, fresh regolith is added, and the cycle repeats. The high-temperature double-sided system has an annular SRHP split in two halves, each with its own side arm, CCHP, secondary condenser and bellows/stepper motor assembly; see Figure 7. The evaporator for the system is located on the exterior surface of the inner vertical pipe. Each SRHP has a separate evaporator, with the vapor space split into two halves by welding a thin Haynes 230 plate on the inside, so that each side of the SRHP (represented in Figure 5 as #1 and #2) has a fixed amount of NCG. Figure 7. Dual sided Haynes 230 demonstration system test setup. Prior to testing, the side arms (primary condensers) were covered with 5 cm of Microtherm insulation. The vertical, annular portion of the system was insulated using the insulation package provided with the ceramic heater. Kaowool was also used as extra insulation and covered the entire system with the exception of the secondary condensers. Figure 8. TC map for the dual sided Haynes 230 demonstration system. 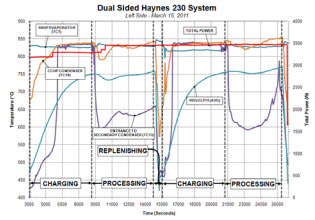 Figure 9 Dual sided Haynes 230 & sodium demonstration system -left side operation. Figure 10. 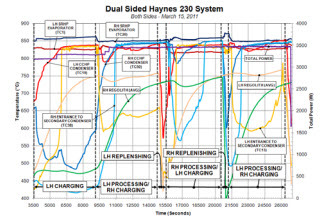 Dual sided Haynes 230 & sodium demonstration system – both sides operating. As seen in the figures, the SRHP evaporator vapor temperature was maintained relatively constant for both sides through all stages of the cycle. A roughly 10°C ΔT was experienced across the wall that separates the two SRHP vapor spaces, as a result of the heat flux transmitted through the splitting plate from one evaporator to the other because of the unbalanced heat load through the two SRHPs. The first charging stage for both the left and right hand sides of the system took approximately 92 to 94 minutes. Charging for the second cycle took approximately 84 to 86 minutes. A ΔT of approximately 100°C was experienced for both sides between the CCHP vapor temperature and the average regolith temperature. The fluidized bed used in a true regolith reactor would greatly reduce this ΔT due to the higher effective thermal conductivity. Soon after charging starts, a sharp increase in the secondary condenser temperature is experienced in TCs 13 and 38 for the left and right sides, respectively. This occurs when the NCG front reaches the entrance of the secondary condenser, rejecting the excess power that cannot be conducted into the regolith. This can be seen graphically as the CCHP vapor temperature at this moment has reached approximately 830°C for the left hand side and 840°C for the right side. A drastic drop in temperature is observed in the CCHP vapor, regolith and secondary condenser during the replenishment stage of the cycle. At this moment the forced air cooling systems for the regolith reactor simulator was turned on to simulate the removal of processed regolith and addition of new regolith. The regolith temperature was maintained near constant for all processing cycles for both the left and right hand sides of the system. A slight dip in temperature is observed in both reactors during processing due to more power being transferred to the opposite side to aid in charging, which is the power heavy stage in the full cycle. To summarize, testing of the dual reactor system was completely successful. PCHPs are a variant of VCHPs, where the amount or volume of NCG in the heat pipe can be adjusted for control of the thermal conductance. PCHPs can be used for precise temperature control at the milli-Kelvin level, and for switching power at high temperatures, where there are no known alternatives. PCHPs for Precise Temperature Control: A series of aluminum/ammonia PCHPs were fabricated that achieved good closed-loop feedback control. The ammonia PCHP was able to maintain a constant evaporator temperature over changes of input power from 50-150 Watts and changes of sink temperature from -10°C to -40°C. The ammonia PCHP met the goal of milli-Kelvin control, by demonstrating a standard deviation of 0.006K in evaporator temperature over time. 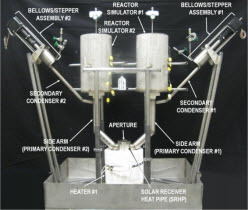 PCHPs for Power Switching: Two PCHPs with integral CCHPs were used to control the thermal loading from a single solar source to multiple lunar regolith oxygen processing reactors. The amount of thermal energy was adjusted between multiple reactors by varying the volume of non-condensable gas (NCG) in the PCHP using a bellows or piston and stepper motor. The PCHPs for Precise Temperature Control program was sponsored by NASA Goddard under Contract No. NNX08CA35C. Laura Ottenstein of NASA GSFC was the program technical monitor. The PCHPs for Lunar Regolith program was sponsored by NASA Glenn Research Center under Purchase Order No. NNX09CA48C. Don Jaworske, NASA/GRC, was the technical monitor for the program. Anderson, W.G, Hartenstine, J.R., Sarraf, D. B., and Walker, K. L. Walker, Pressure Controlled Heat Pipes, 41st International Conference on Environmental Systems (ICES 2011), Portland, OR, July 17-21, 2011. 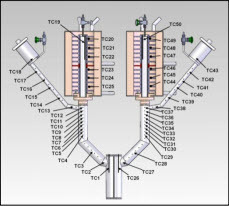 Bienert, W., Isothermal Heat Pipes and PressureControlled Furnaces, Isotech Journal of Thermometry, 2(1), pp. 32-52, 1991. Hartenstine, J. R., Walker, K. L., Tarau, C., and Anderson, W. G., PCHP Solar Receiver for Regolith Oxygen Production with Multiple Reactors,” 49th AIAA Aerospace Sciences Meeting, Orlando, FL, January 4-7, 2011.